Hi again everyone! 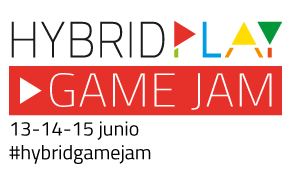 Let us remind that the following 13th, 14th and 15th June we have a Hybrid Play Game Jam both online and in the Espaitec 2 of the UJI (Castellón). Fortunately everyone can be a game developer nowadays, and we at Hybrid Play want to celebrate the opportunity to create games together with experienced and beginner developers. Programmers, musicians, artists, designers… all kind of developers are invited to join our game jam, including children (or adults without game dev preparation). For them, we’re offering Visual Programming workshops with Gamesonomy. The awaited day is approaching, and as we finish every possible preparation, we’ve brought a lot of interesting tools. Obviously 48 hours is quite a short time to create a game, but nothing we can’t achieve knowing the tools. Take a look at our list of resources, including video tutorials for Gamesonomy (sorry, only in Spanish yet!). You’re still on time to sign up for any modality, either presential or online!